It was one of those bleak London evenings where the sky was an oppressive shade of grey and the blustering winds forced my umbrella inside out and caused my windswept hair to stick annoyingly to my lip gloss. 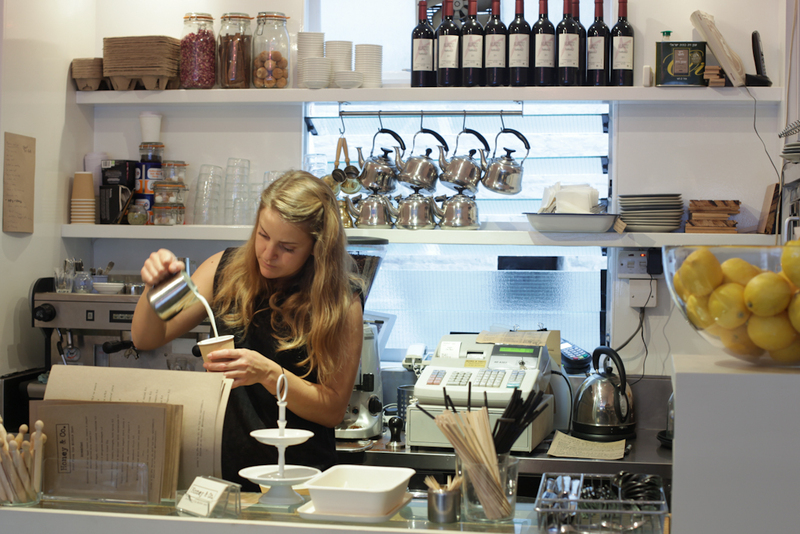 I ventured to the deepest depths of Fitzrovia on a mission to find the much praised Honey & Co. Walking up Warren Street, Honey & Co stood out like a shiny beacon and upon entering all ills were forgotten. It’s a tiny place with only 20 covers so be prepared to pull out a few contortion moves to get to your table. 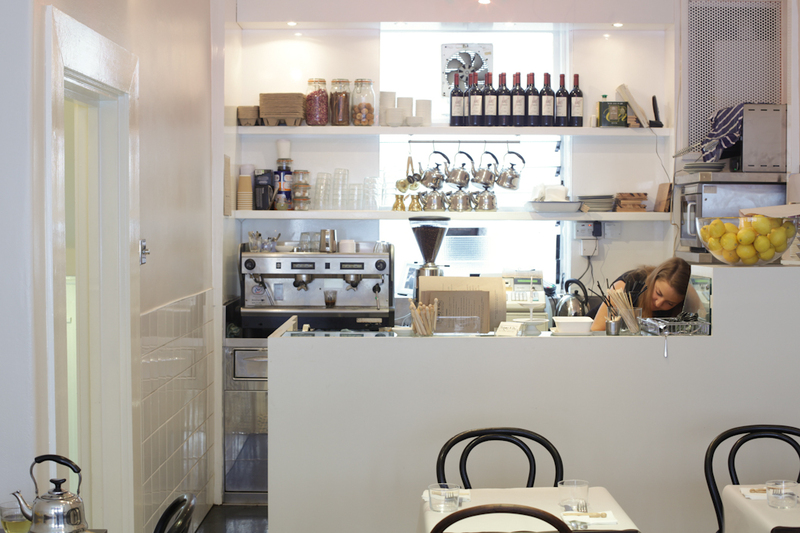 The interior is simple and minimalist with clean lines and whitewashed walls but is warmed up by friendly faces, a relaxed ambience and a touch of candlelight. The daily changing menu is largely influenced by Middle Eastern cuisine and seems to place an emphasis on fresh seasonal ingredients. You can see the influence of Yotam Ottolenghi in their cooking – it’s fresh, colourful and exploding with flavour. The set menu, which includes a selection of mezze, main course and dessert all for £29.50 ,seems like great value for the city centre. To start with we had the Jerusalem style falafel (£7) served with tahini and a side of tomato chilli and pomegranate salad. 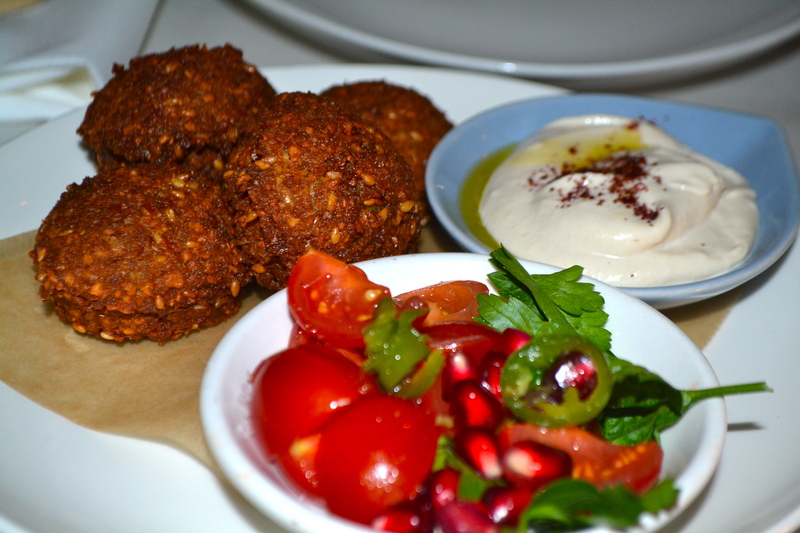 The falafel had a crisp crunchy outer shell and was deliciously moreish. Seasoned with a hint of cinnamon and sesame, the falafel complemented the creamy tahini brilliantly. It was difficult to decide on the mains -they all looked equally tempting. For something different I tried the Mushahan chicken (£13.50). Wrapped and baked in flat bread the dish was brilliant executed and I couldn’t wait to bite into it to see what lay beneath. Unfortunately it was so good I didn’t have time to take a photo. The flat bread literally exploded with tender chunks of slow cooked chicken in a sweet and sticky marinade of pomegranates and currants. The sumac salad was refreshing and provided the dish with a bit of a zesty punch. The mushroom sfiha (£12.50) was equally lovely. The mushrooms were delicately cooked, just tender with a devilish cumin and lemon seasoning. The sfiha, often referred to as the Arab version of pizza, encased the mushroom filling in a beautiful flower like shape. 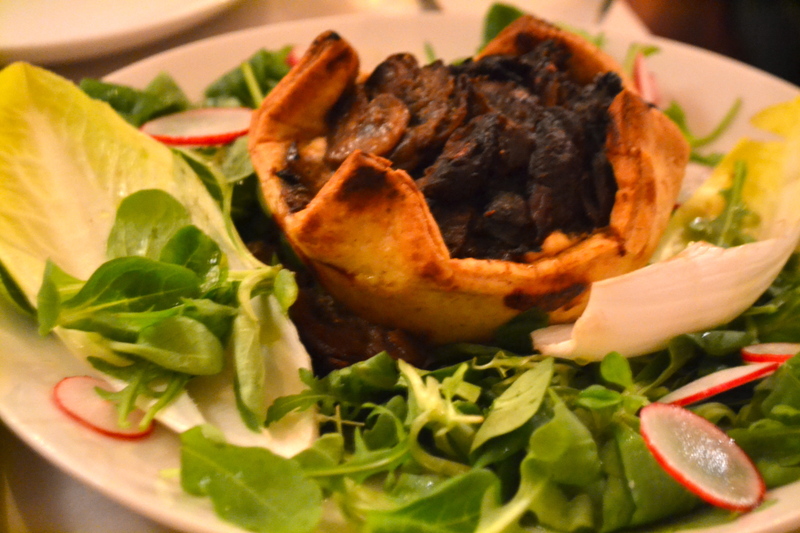 It reminded me of an elegant version of an open mushroom pie. We managed to just squeeze in a helping of dessert each. I am a big sucker for a cheesecake so couldn’t resist this slightly deconstructed version. It was a beautifully textured dish with a heavy lashing of rich cream cheese resting on the top of the impossibly crisp Kadaif pastry. For extra decadence it was sprinkled with whole almonds, berries and Regents Park Honey which gently oozed out of the crispy pastry at the bottom. This is a dessert of the gods. 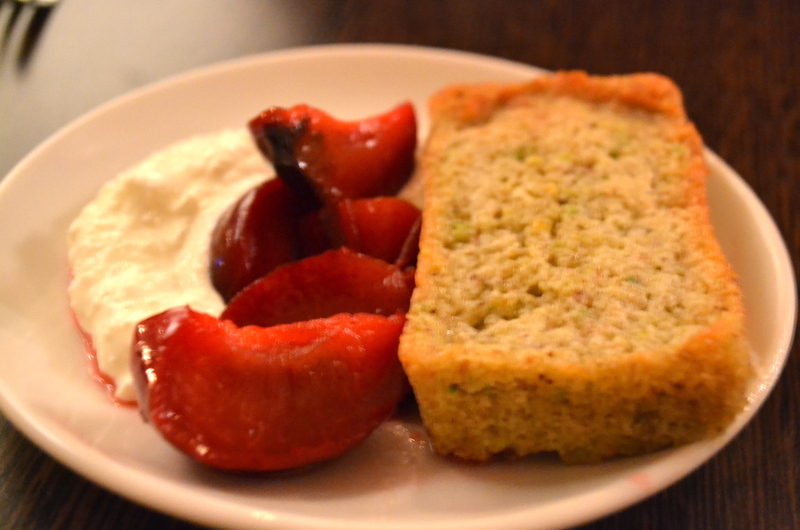 The pistachio cake was another winner. Fresh from the oven it was served with roasted plums which sweetened the cake and provided it with an extra punch. it was a perfect comfort food on a gloomy London day. 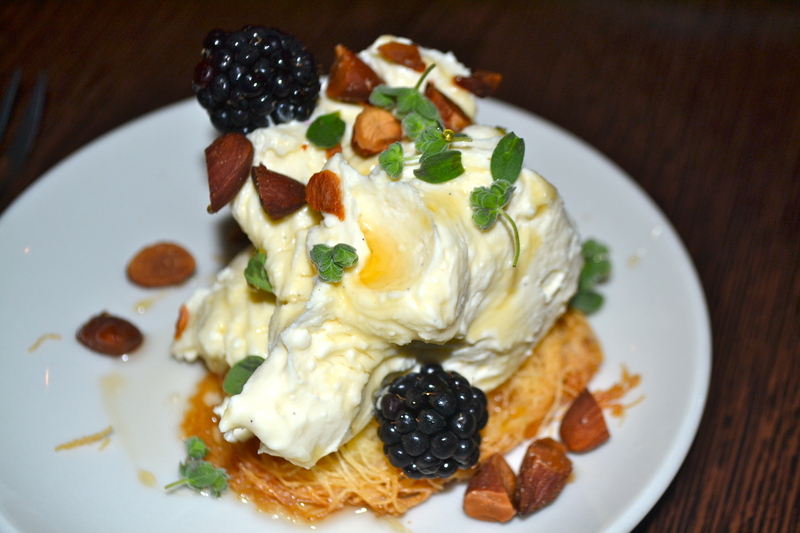 With their honest food and friendly atmosphere, Honey & Co did the unthinkable and surpassed my expectations. It may not have all the bells and whistles of some restaurants, but makes up for it with heart and good honest cooking. I will definitely be back. Under £80 For a starter, two mains, two desserts including wine and service. Bookings essential. 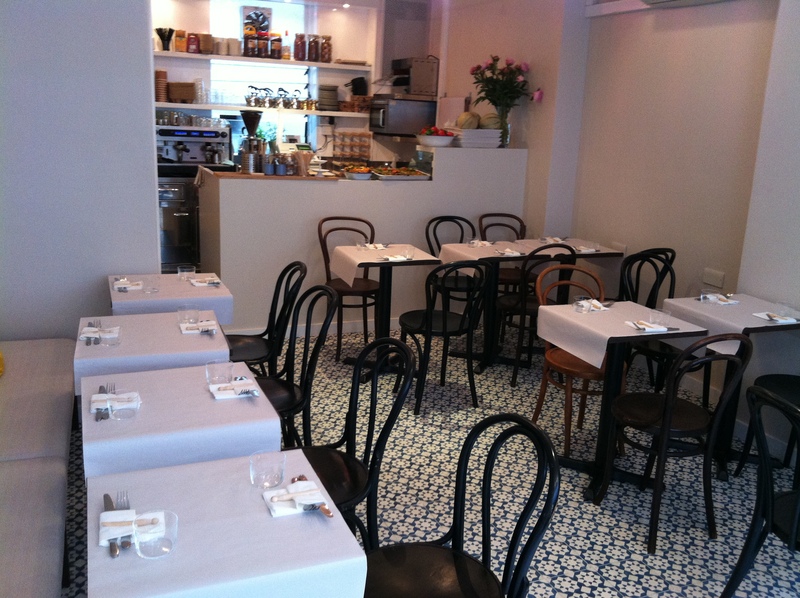 25a Warren Street, London W1T 5LZ Tel. 0207 388 6175. Opening hours: Mon 8:00am – 18:00pm Tue-Fri 8:00am – 10:30pm. Sat 9:30am – 10:30pm Closed Sunday. 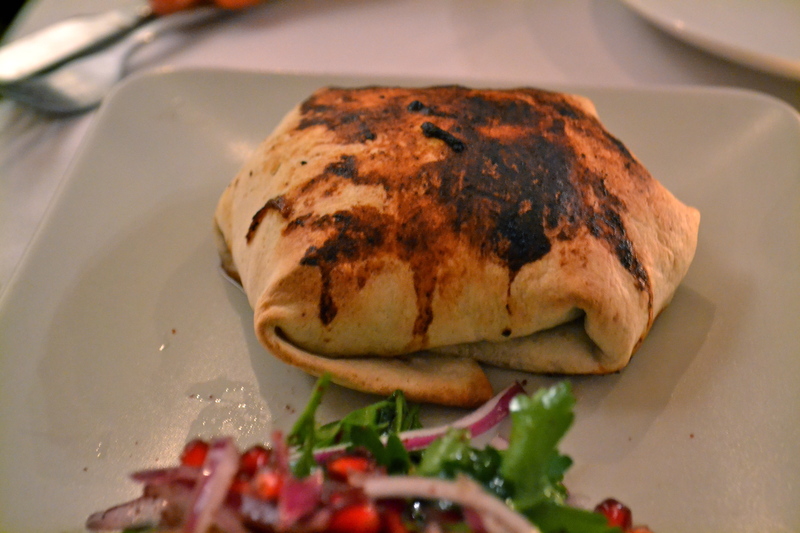 Previous Post Dishoom’s Ginger Pig Bacon Naan Roll – is this the best bacon roll in London? Once again, this is somewhere that is high on my List! You seem to always be one (or two) restaurants ahead of me! Ha ha always good to have someone to try before you incase it’s bad. Hope I’m not ruining the surprise too much for you!